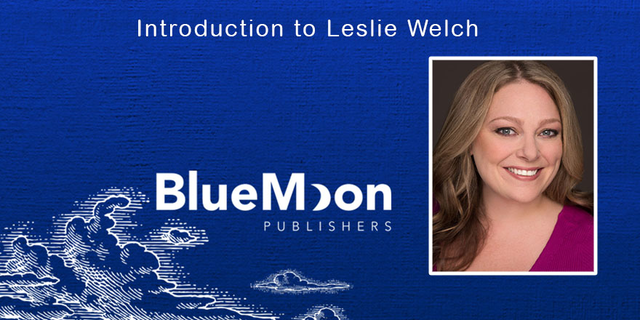 Join us as we chat with women’s fiction author Leslie Welch, the newest member of the Blue Moon Publishers family! I always knew I was a writer, but I didn’t actively pursue writing as a craft until my junior year of high school. Growing up, I had an extremely active imagination (which usually manifested itself as lies to help me wiggle out of trouble). Luckily, I had an amazing English teacher who encouraged me to use my imagination for creative fiction instead of lies. In college, I took a lot of different writing classes, but let one professor derail my dreams for a while. He told me my writing was too “sensational” and that I wrote like Stephen King (which he meant as an insult). I abandoned writing after that. It wasn’t until I felt unappreciated at work that I started writing my first book. It was a way to escape a very toxic environment with “corporate sponsorship.” I left that job, but continued to write. That’s when I really knew I wanted to be a writer. Writing dialogue. Hands down. I can hear my characters, so it’s easy to transcribe what they’re saying. Describing places, objects, and emotions is a close second. I love to figure out interesting ways to bring the reader’s senses into the story. What inspired you to begin writing your novel? I always do creative exercises when I’m bored. On a four hour drive from DC to my childhood home, I tried to come up with another reason I might be making the drive. I’m a rockstar going home. Then, I upped the stakes. I was going home to see the guy who inspired all my songs. I upped them even more. He was dying. Boom! I had my hook. I decided to use it for NaNoWriMo, but write it from a male perspective to challenge myself. Do you have a writing routine, and if so, what does it look like? I’ve trained myself to be flexible. I write anywhere and everywhere: in line at the grocery store, in waiting rooms, in my (parked) car waiting to pick my daughter up from activities. But I wrote most of this book during my commute into DC on the metro. I’m very sensitive to my surroundings. I’m always observing people and listening to people, trying to understand who they are, what they’re thinking. I make up scenarios about them. A lot of my characters are born that way—from people I see in restaurants, or meet at a party. I throw a little bit of myself in there, too. Can you describe your revision and/or editorial process? Their answers help me with the last edits. I could keep editing forever, but I’m learning when to walk away and hand the manuscript over to the professionals. A local entertainment paper paid me fifty dollars for an essay in college. I still have a laminated copy. Have you ever been published in a local paper? Did you keep a copy? One of my “OMG! I can’t wait reads!” I’m always looking for new author’s to read especially if it looks like a book that will pull every emotion out of me. I’m a rare reader that loves an ugly cry read, doesn’t need an HEA ending and absolutely geek out when a book leaves me hanging! I stumbled on The Goodbye on Amazon and then looked for the author. I have a feeling she’s going to be someone I’ll be encouraging everyone to read!